Patriot modular aluminum marine docks provide the ultimate in shoreline enjoyment. Our 12-inch deep aluminum truss frames are expertly crafted with welded and bolted connections. We use 7/16 inch diameter aluminum chord rods, not 3/8 inch like most of our competitors. Pipe is all 1-1/2 inch schedule 40 electro-galvanized steel, not lighter weight steel tubing. Our pipe brackets are extra long with two - not one - stainless steel set bolts. Lightweight marine grade aluminum frames weigh only 45 lbs. EVERBILT premium Double Braid Nylon Dock Line has been designed to maximize durability and performance in harsh marine conditions. Professionally hand spliced 10 inch eye loop on one end for attachment to cleats or other devices. Nylon has great strength and shock load resistance, handles easily, and resists sunlight better than all other synthetics. Double Braid offers an excellent combination of stretch with excellent shock load reduction. Nylon does not float, so it's the optimal material for anchor lines. Do not use for overhead lifting. Never exceed the Safe Working Load (SWL). 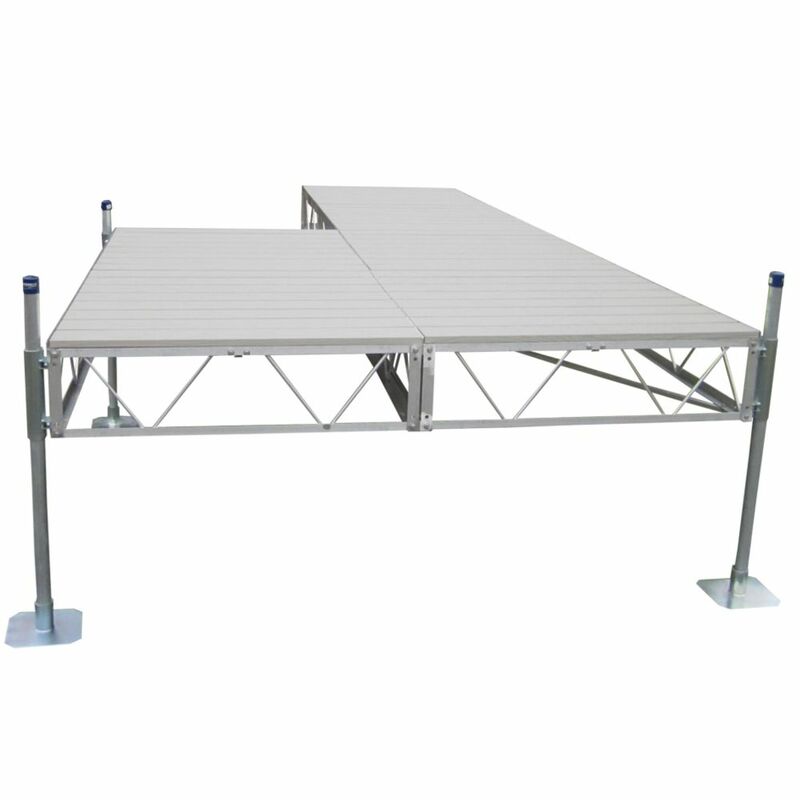 Floating Dock Hardware component manufactured from 5 Gauge (1/4") hot dip galvanized steel. Slot size is 9/16". Inside Corner with Brace offers maximum corner strength when used with the outside corner or any other corner connector hinge. Patriot Docks floating dock structures are excellent for deep or fluctuating water levels and soft lake bottoms.Three 12 inch polyethylene rectangular floats are recommended per 16 ft. of dock frame. Add multiple floating structures together to achieve desired size and configuration. Use the universal Floating Hinge Kit (PN# 10845) to secure the floating dock structure to a stationary pier or between longer floating sections. Includes 2 inch i.d post brackets designed to accept 1-1/2 inch i.d piling post or to be used for anchor point. The Patriot Low Profile Floating Dock sits close to the water surface for easy access in and out of the water. Low Profile Floating Frames are made from 6000 series marine grade aluminum and have gusset reinforced corners. The aluminum frames measure 48 inchW x 96 inchL x 4-1/2 inchH and use rectangular foam filled floats along with pilings or anchors to create a stable and versatile floating pier. Low Profile Frames are joined together using a heavy duty floating hinge that allow the frames to articulate and move with the waves. Frames can be bolted directly together in parallel or use the Floating Hinge Kit to add perpendicular fingers. 40 ft. Patio Dock with Gray Aluminum Decking Patriot modular aluminum marine docks provide the ultimate in shoreline enjoyment. Our 12-inch deep aluminum truss frames are expertly crafted with welded and bolted connections. We use 7/16 inch diameter aluminum chord rods, not 3/8 inch like most of our competitors. Pipe is all 1-1/2 inch schedule 40 electro-galvanized steel, not lighter weight steel tubing. Our pipe brackets are extra long with two - not one - stainless steel set bolts.